What is an Indiana Sublease Agreement? Indiana Sublease Agreement: What Is It? 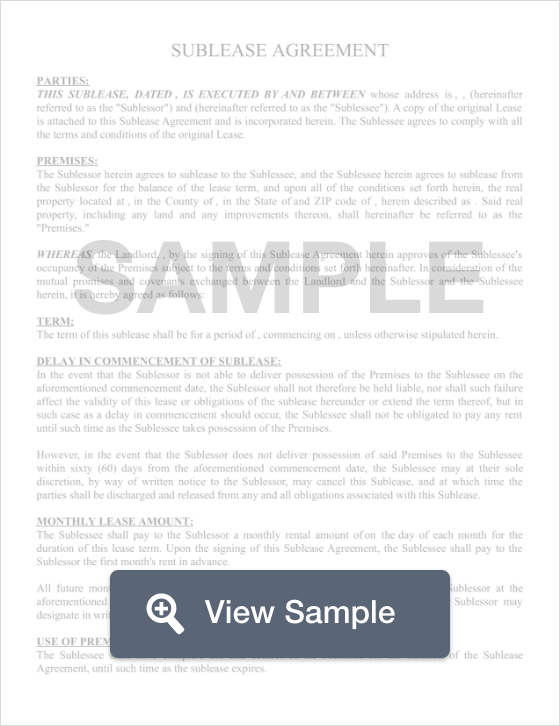 An Indiana sublease agreement is a legal document that spells out an agreement between two tenants; (a sublessor) the original tenant and signor of a lease, and a (sublessee) a new tenant that will be replacing the sublessor. This is a common agreement often used if, for example, a tenant needs to travel out of town for an extended period of time and would like someone to rent the apartment while they are gone. It is important for the sublessor to ensure that they thoroughly vet the sublessee, as the original tenant’s name will remain on the lease. If anything unfortunate should happen while the sublease agreement is in place, such as property damage or late rent payments, the original tenant will be held responsible, as his or her name will remain on the lease until the end of the lease term. In Indiana, sublease laws are vague and provide no specifics on a tenant’s rights to sublease. If a lease contract is unclear on whether or not a tenant may sublease the unit, it is wise for the tenant to consult with the landlord and receive written permission before entering into a sublease agreement with a sublessee.